Amidst shaken Martinis, cocktail waitresses and a jazz quintet, the Plasencia Alma Fuerte made its official debut last Thursday night in New York City at the Carnegie Club, one of Manhattan's more urbane smoking rooms. 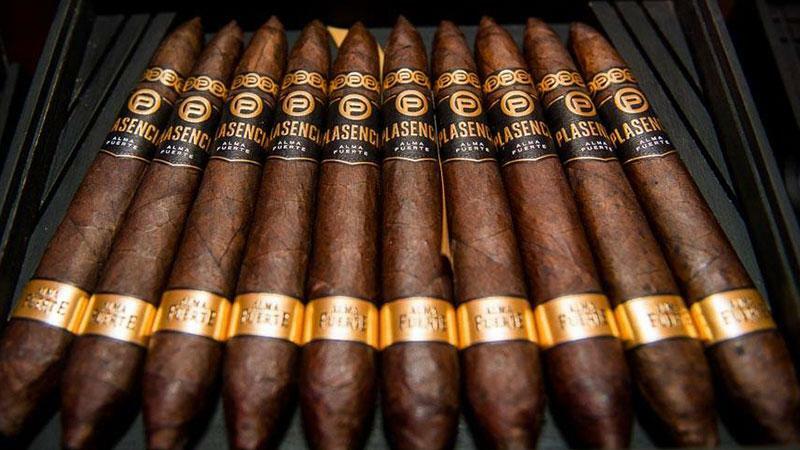 It's the first brand to come from the newly formed Plasencia 1865 company, which serves as the Miami-based distribution arm for all Plasencia branded cigars. The Plasencia family has been growing tobacco for five generations and is widely regarded throughout the industry as one of the largest producers of premium cigar tobacco in Nicaragua. They are also in control of three major factories and make brands under contract for many major third-party cigar companies. But the Alma Fuerte cigar represents the Plasencia's first major push to get their own brand (and their own name) into the market. Plasencia drew from his family's vast library of aged tobaccos to come up with the final blend for Alma Fuerte, which is made entirely from Nicaraguan tobacco. The primary component is Criollo '98, but the Plasencias have planted this seed all over Nicaragua. Alma Fuerte is a blend of tobacco from four growing regions: Estelí, Condega, Jalapa and Ometepe. "It wasn't just me who blended it," assured Plasencia. "It was a group effort of about five people, including my father." He characterizes the cigars—which are enveloped in dark, oily shade-grown wrappers from Jalapa—as being medium to full bodied. Alma Fuerte comes in three sizes: the box-pressed Nestor IV, measuring 6 1/4 inches by 54 ring gauge; Generacion V, a 7 by 58 box-pressed salomon; and the hexagonally pressed Sixto ii, a six-sided cigar at 6 by 60. Why a hexagon? "The hexagon is nature's most perfect shape," said Plasencia. "Think of the honeycomb. And it burns perfectly." They come in 10-count boxes with an unexpected twist: the lid doubles as an ashtray. Once you remove the top of the box, you can flip it around and the first thing you see is a branded pewter plate surrounded by four deep grooves to hold your cigar. But the cigars won't come cheap. They have suggested retail prices from $20 to $22. Plasencia, however, bristled at the idea that the high cost might come as a result of the elaborate box. "It's not the box," he insists. "It's the aged tobacco. I know it's bold to come out with a cigar in this price range, but I think we need to make a bold statement. Our family has been growing tobacco for over 100 years. And we have excellent tobacco in our inventories that we have been selecting and putting aside for a long time." The Plasencia Alma Fuerte is made in Nicaragua at the Plasencia Cigar Factory in Estelí, and is the first in a series of upcoming releases from Plasencia 1865. Four more lines in the Alma series are slated to follow. For a vertical brand tasting of the Plasencia Alma Fuerte, seen upcoming issue of Cigar Insider.